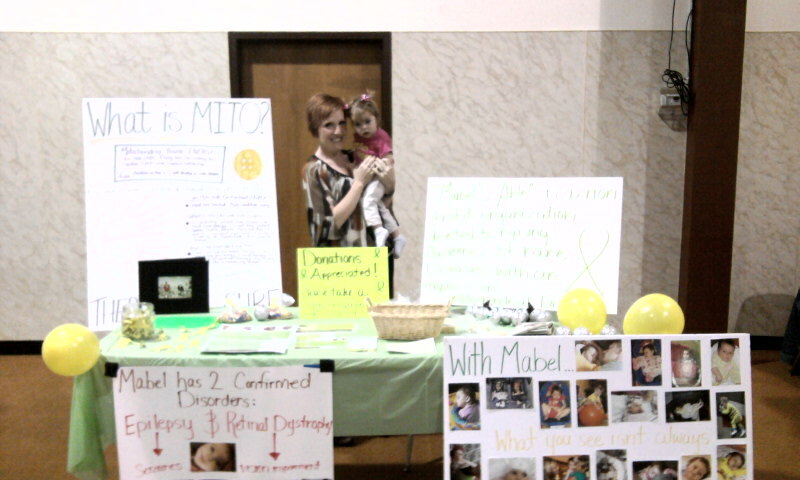 My girl and I made an appearance at our Mabel's Able booth today at the Christmas Open Market at our church here in town. It was exciting to see our information out for the world to see. Did you know that since doing the race in July Mabel has been diagnosed with 'failure to thrive?' That is part of the reason we got her a G-tube; so that she could grow and get the proper nutrition to hopefully help her make some gains. Did you know that if we lived in another country Mabel would most likely be placed in an institution? Disabled children rarely stay in the homes of their families if there is a place that they can be sent to receive care. Doesn't it break your heart? Did you know that children with Mito often cannot regulate their body temperatures. Mabel gets red cheeks very often so if you see her and notice--this is why. She also gets very cold hands and feet at times for no apparent reason. Although we don't have a confirmed mito diagnosis, this is another huge sign to me that we are dealing with something mitochondrial related. This also goes hand in hand with her inability to distinguish between hot or cold. Did you know that disability benefits in our country are based on income and not on the rate or severity of disability? There is very little help to families who make enough to provide for their healthy kids but not quite enough to take good care of their sick ones. Did you know that some experts believe that 30-40% of special needs children do not have an exact diagnosis? Is there not something wrong with that? Did you know that a 'rare disease' is considered less than 220,000 affected people? Mito shows itself 1 in 4,000. Not so rare, huh? Yet extremely hard to diagnose. "Mabel's Able" & "Raising Redheads Blog"
Also...we will be starting a candle fundraiser in the next couple of days. They are delicious smelling and we will be selling an 8 oz candle for $10. "Mabel's Able" will receive 60% of the proceeds and they will make wonderful Christmas presents! Contact me for more information!!! Ramee, this set up looks great! You are such a wonderful & inspirational advocate for your child. You & the family are always in my prayers. Stay strong in Christ. Also, your "thankful tree" has given me a great idea for me & my kids to do. As a homeschooling Mom myself, I am always looking for great ideas. Thank you again for all your honesty.